Broker Ord Minnett has retained a Hold rating in GWA Group despite having a price target of $2.34 per share, which is below its current price of $2.53. Ord said it was encouraged by the results so far from GWAs recent restructuring and expected modest rebound in activity, but believed this is already factored into the share price. It points out that revenue contracted by 8 per cent despite including three months contributions of $6 million from API. December half trading earnings (EBIT) declined 22 per cent, which it said was due to a decline in margin cost due entirely to GWAs relatively high fixed cost base. Trading EBIT for the Heating & Cooling segment declined 36.2 per cent due to a fall in rebates, Bathrooms & Kitchens declined by 14.6 per cent due to weak volumes, and Doors & Access declined 22.9 per cent on performance issues in Gliderol. Qube Holdings shares reached a new all time high of $1.885 on 25 February, the day before the company announced its half year results. The last time the shares approached this level was in March 2012 and April 2011. However, the shares fell away by around 10 cents after the results release, despite a record first half with revenue up 32 per cent and net profit up 19 per cent. On a statutory basis, revenue was up 52 per cent and profit after tax up 323 per cent. Qube said it had strong growth across both its Ports & Bulk and Logistics divisions. The fully franked interim dividend is 2.2 cents per share, up 10 per cent. The payout ratio is 54 per cent of Qubes underlying earnings per share. Managing director Maurice James said The demand for Qubes port rail services continued to increase, with Qubes rail business benefiting from the availability of the locomotives and wagons acquired in the previous financial year. Qube has secured several new rail contracts and expects to acquire further rolling stock during the second half of FY 2013. The properties in the Strategic Assets division continued to generate an attractive yield, and underlying revenue rose to $12.9 million, reflecting Qubes Moorebank investment being consolidated for the entire period whereas Qubes 30 per cent interest was equity accounted in the prior period. Planning is underway for the long term use of the Minto site, said Mr James. Tox Free Solutions had a good December half with revenue rising 43 per cent $131.6 million and net profit rising 33 per cent to $10.5 million. The growth was assisted by acquisitions, including DoloMatrix International, and the commencement of hazardous waste services in Tasmania. As is normal, there is no interim dividend. The company has sold Entech International including Entech China, which were part of DoloMatrix and had been making losses, to focus on Australia. Tox Free said its tender book is at an all time high with a number of tender's submitted pending award. It has given more resources to its business development team to focus on organic growth. Energy Actions shares spiked to a new all time high of $3.63 on 28 February after touching a recent low of $2.75 on 25 February. Shares in ERM Power spiked to a new all time high of $2.50 on 25 February, and on higher than normal volume. However there was no news apart from the good half year results four days earlier. Gale Pacific has been added to the All Ordinaries Index in the March rebalance by S&P Dow Jones. Reece Australia saw half year revenue fall 0.6 per cent to $785 million and net profit fall 5 per cent to $54.9 million. The interim dividend is the same at 21 cents fully franked. Sales were impacted by the challenging trading conditions in the building and construction industry in both Australia and New Zealand, said the company, prompting it to continue to manage costs tightly. The current economic conditions are expected to continue well into 2013. Reece opened 10 new outlets during the first half, including the acquisition of an independent plumbing business with two branches. It now has 456 outlets in Australia and 7 in New Zealand. It also refurbished some trade and showroom outlets. Net assets $16 million to $722 million through retained profits. Eco Investor has downgraded Tag Pacific from a core to a satellite security based on its first half loss and its lack of an interim dividend. Tag Pacific reported a net loss of $1.5 million on revenue of $30.6 million for the December half. This compares with revenue of $38 million and a profit of $4.8 million in the December 2011 half. The company said the outlook for the second half of the 2013 financial year is more positive, and if it returns to profitability and pays a final dividend, Eco Investor will look at upgrading the stock. The major contributor to the loss was a 20 per cent fall in revenue compared to the December 2011, based on the downturn in the residential rooftop solar market and general economic conditions that hampered sales of MPowers core distribution products. The company also said the timing difference between the completion of existing contracts and the start of the next series of specialized projects was significant in limiting profitability and generating. Integration costs of $0.5 million also contributed to the loss. Australian Ethical Investment has appointed Kate Greenhill as a non executive director. Ms Greenhill has executive experience and knowledge of finance and risk through providing assurance and advisory services to clients in the financial services industry. She is a former Partner with PricewaterhouseCoopers, and has assisted clients with advice and assurance for financial statement audit opinions, accounting and regulatory developments, capital raisings, accounting complex transactions, due diligence, valuations, compliance, risk management, organizational structure and the operation of controls. 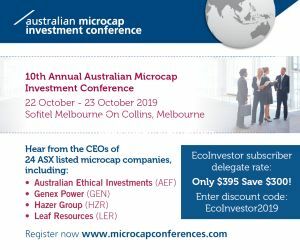 Australian Ethical Investment manages the Australian Ethical Smaller Companies Trust, Climate Advocacy Fund and Australian Ethical International Equities Trust. Australian Ethical is about to relaunch its Climate Advocacy Fund, said managing director, Phillip Vernon. This includes renaming the fund to the Australian Ethical Advocacy Fund, and the corresponding strategy in the superannuation fund to the Advocacy investment option. A relaunch is consistent with the recent significant changes in the Funds strategy, such as no longer being an index fund and instead using an ethically screened active investment style. The Aspen Parks Property Fund had net investor inflows of $15.4 million, up 8.4 per cent on the first half of 2011-12, said parent company Aspen Group in its half year results announcement. Gross inflows were $19.6 million, a 4 per cent increase. Aspen holds an 8.7 per cent equity interest in APPF. The fund paid Aspen $4 million for management services in the half, down $0.3 million on the comparable 2011-12 period due to lower non recurring performance fees. The Funds focus is further investment in its portfolio. Aspen said to date $19.6 million of capital expenditure has been approved and is underway across six parks. The strategy is to increase accommodation capacity at a number of parks and improve amenity for residents and visitors. The Funds gearing fell to 26 per cent at December from 31 per cent at June 2012. Fund operations for the first six months have seen a change in the mix of income, with many of the tourism properties performing above budget, offset by a softening in revenue from mining accommodation, said Aspen. Energy World Corporation saw revenue fall 15 per cent to US$66.3 million for the half year to 31 December 2012. Profit was down 4.8 per cent US$10.1 million. The company expects to complete the 60MW gas turbine expansion at the Sengkang Power Plant in Indonesia this month. It expects to complete the construction and installation of the first train of the Sengkang LNG Project by the end of first quarter 2014. Carbon Conscious saw its revenue fall 9 per cent to $5.4 million for the December 2012 half, and its profit after tax fall 17 per cent to $777,728. Net tangible assets per share were 19 cents, up from 15 cents in December 2011. CBD Energy returned to profit in the December half, reversing an $8.5 million loss in December 2011 into a net profit of $5.6 million. Revenue rose 47 per cent to $55.4 million. The sale of solar projects in Italy and the US, equity close on the Taralga Wind Farm with partner, Banco Santander, and a return to profitability by subsidiaries Parmac and Captech were the main contributors to the improvement. There was also significant cost cutting in the Australian solar business. Further solar announcements will be made in coming weeks, said executive chairman, Gerry McGowan. Our operations now span Asia, Europe, the US and Australia and winning projects in all these markets has not only returned the company to profitability but established a significant pipeline of forward work. Additionally all subsidiaries are performing to plan, he said on the turnaround. Liquidity is an issue and among initiatives is a share purchase plan in coming months before the planned NASDAQ listing. Clean TeQ Holdings made a December half loss of $1.9 million but predicts the second half will remain buoyant and see a recovery in both revenue and margin, said chief executive, Peter Voigt. We are in advanced discussions with a major global engineering services company which could result in the opening of a global market for our proprietary water technology platform, he said. Revenue fell to $3.8 million from $4.4 million the previous December half. The net loss was due to unsatisfactory margins on some projects in the Air Division based on delivery issues and subsequent cost overruns. CMA Corporation reported a net loss of $52.8 million for the December half compared with a loss of $18.24 million for December 2011. Half year revenue fell from $132 million to $98.8 million. The result reflect CMAs ongoing restructuring which over the past four months has included the sale of some non core assets and further reductions in global headcount, said the company. In these four months, asset sales raised more than $2.6 million with the proceeds used to repay bank debt. Managing director, John Pedersen, said the current program to lower operating costs and focus on core assets will build on the restructuring measures implemented due to the global market downturn. The improved focus on managing working capital on a site by site basis is already evident and the closure of unprofitable yards will allow CMA to trade more profitably as a group and deliver positive cash flows, he said. Environmental Group made an after tax profit of $313,950 for the half year to 31 December 2012, compared with loss of $362,678 for the December 20101 half. However, the result comprised a loss from continuing operations of $470,453 offset by a gain from discontinued operations of $784,403. The period was one of considerable change and the result from continuing operations bears much of the cost of these changes, said chairman Louis Niederer. Revenue fell from $16.9 million to $11.7 million, due to the absence of revenue of EGL Management Services Pty Ltd, which was placed into liquidation in August last year, and reduced revenues from Mine Assist due to the reduction in activity in the coal industry. Mr Niederer said the standout performer was Total Air Pollution Control Pty Ltd (TAPC), which reported a profit before tax for the half of $1.3 million on revenue of $6.4 million. During the half year, the Gas and Vapour business was integrated into the TAPC business. The combination creates a complete offering for TAPC in its area of expertise, he said. Vapour was a significant business for EGL prior to the GFC and a sales manager has been appointed to reinvigorate the business. Plastics recycler Novarise Renewable Resources recorded a profit of $16.99 million for the full year to 31 December 2012. This was down slightly on the $17.0 million in 2011. Sales revenue was up slightly to $82.4 million from $80.3 million, and total revenue was up 5 per cent to $87.3 million. The company said sales in recycled PP yarn and PP webbing products grew due to continued growth of market acceptance of its products. During 2012 the company began marketing finished products such as notebook bags, shopping bags, hotel slippers and work clothing. In 2012, the company won a silver award for environmentally friendly computer bags, hotel slippers and its renewable polypropylene fibre spinning process at an innovations exhibition in Fuzhou. It obtained nine utility model patent certificates from China for backpack, satchel, storage box, waist pack, computer bag, work cloths, slippers, shopping bags, and mountaineering bags. The completed Nanan production facility will be capable of producing 200,000 tonnes of PP products per year. The first production line was commissioned last October. Another four production lines are now being installed, with two scheduled to be in production in April and the other two scheduled for commissioning in June. Another three production lines are scheduled to be installed in May and to be brought online in October. Quantum Energy has returned to profit with a small half year profit from continuing operations of $440,000 against a loss of $527,000 in the December 2011 half. The statutory profit was $387,000 against a December 2011 loss of $1.8 million. Revenue from continuing operations was up to $23.1 million from $21 million. Solco saw a 45 per cent fall in revenue to $6.2 million in the December half. Its loss increased from $2.6 million to $4.4 million. Chairman David Richardson said the Australian solar PV market continued to contract in the six months to December. Structural challenges to the sector globally, (i.e. global manufacturing over supply, domestic wholesale/ retail servicing over supply), continue to have a negative impact on Solcos net profit, primarily in the form of declining turnover levels and stock value write downs relating to our wholesale operations, he said. Solar pumping has grown to 30 per cent of product sales. Ceramic Fuel Cells has been removed from the S&P/ ASX 300 Index in the March quarter rebalance by S&P Dow Jones. The company recorded a loss of $12.6 million for the December half year, similar to the loss of $12.4 million for the December 2011 half. Total cumulative orders received to the end of December were 661 units - 394 BlueGen units and 267 integrated mCHP units. Of these, orders for 329 units have been fulfilled and the remaining open orders of 332 units are expected to be supplied in 2013. Galaxy Resources has appointed lithium sales and marketing consultant Joe Lowry to its sales and marketing team. Mr Lowry spent 23 years with lithium major FMC Lithium and was most recently FMCs Global Sales & Business Development Director, responsible for sales of US$240 million worldwide. Prior to this he was FMCs managing director, Asia Pacific. Galaxy Resources has settled the second tranche of a $20 million funding facility with Deutsche Bank following the recommencement of operations at the Jiangsu Lithium Carbonate Plant in China. Galaxy received $10 million under the two tranche financing arrangement with Deutsche Bank. The first $10 million settled in 17 December last year. Cardia Bioplastics made a reduced loss of $1 million for the six months to 31 December 2012. The December 2011 half loss was $2.1 million. The main reason for the improvement was cost savings from the restructuring measures put in place from June 2012. Green Invest made a loss for the half year ended 31 December 2012 of $790,713, similar to the $749,198 in the December 2011 half. The company said the result reflects the final phase of its transition in the last 18 months and the restructure of its business model to incorporate the three sustainability divisions of water, energy and food. The result includes Green Invests start up costs for its Green Plumbers operations in the US, the online Green Building Store in Australia, preliminary transaction costs for the funding proposal announced in December, and the settlement of a legacy legal issue which cost the company about $300,000, said chairman, Peter McCoy. In December 2012, Green Invest signed a term sheet for a $5.8 million funding proposal of debt, equity and a convertible debenture to acquire aquaculture assets from Ecofish International Pty Ltd and RAD Aqua so it can launch its food division and to pursue growth in South East Asia, and in particular Singapore. Intermoco has raised $500,000 from a placement to sophisticated investors through a stock broker. Intermoco has December half revenue of $1.5 million and a loss of $1.1 million. Orbital Corporation has sold a 12 per cent interest in Synerject LLC to fellow owner Continental Corporation for US$6 million. Orbital retains 30 per cent. Orbital will make a profit of US$1.5 million on the sale and increase its cash to $10 million. The cash will fund growth. Pacific Environment had an encouraging December half, turning around a December 2011 half loss of $230,000 into a profit of $694,000. Revenue rose 28 per cent to $6.7 million. The company said it was its best ever six months performance. Phoslock Water Solutions saw its revenue fall 38 per cent to $735,000 in the December half, and its net profit loss rose from $711,014 to $992,672. The company said revenue was affected by a number of orders being delayed from October December 2012 to the first half of 2013. Sales orders received from 1 January to late February total $450,000. RedFlow saw a big drop in December half sales revenue to $503,395 compared to $2.4 million in the December 2011 half year. However, the total loss fell considerably to $1.7 million from $6.1 million. Refresh Group increased its first half revenue to $3.4 million from $2.9 million in the 2011-12 first half. However, the loss decreased only marginally to $74,025 from $107,775. The 15 per cent revenue growth was due to additional marketing across the whole company. Refresh said all four operating segments are profitable and the growth trend is anticipated to continue. Vmoto reported a net loss of $1.2 million for the six months to 31 December 2012, an 83 per cent decrease in comparison to the net loss reported for the 12 months to 30 June 2012 of $6.8 million. The improvement was mainly due to lower operating costs from ongoing rationalization of operations and more streamlined processes. In November Vmoto dual listed on the UKs AIM market, and paid one off costs to its advisors. WestSide Corporation has entered the All Ordinaries Index in the latest rebalance by S&P Dow Jones. The company had a very strong jump in revenue in the December half to $6.3 million from $3.8 million in the December 2011 half year. However, it made a loss of $5.6 million. Lynas Corporation has produced its first rare earth products for customers. In January the companys Lynas Advanced Material Plant in Malaysia commissioned the cracking and leaching rare earth extraction units, and the recovery rates from the cracking units are now over 90 per cent of the contained rare earth oxides (REO). Lynas said it has been working through early stage production issues that are typical for a start up plant, and is focusing on increasing throughput. The target for the Phase 1 nameplate production capacity of 11,000 tonnes per annum of REO is the second quarter. LED technology developer, BluGlass has moved another step closer to commercialization by using its low temperature Remote Plasma Chemical Vapour Deposition (RPCVD) technology to produce p type gallium nitride (GaN) films with industry equivalent electrical properties when grown on top of MOCVD GaN templates. BluGlass has demonstrated its p GaN films grown at low temperature have electrical properties equivalent to films grown using the industry standard high temperature MOCVD process. The electrical properties have been independently verified by The Australian National University, a leading university in semiconductor physics. BluGlass says it is now in a position to commence experiments targeting improved LED device efficiency using RPCVD grown p GaN layers to demonstrate the commercial value of a low temperature technology. The breakthrough follows the companys proof of concept milestone late last year. With a lower growth temperature than MOCVD, the RPCVD technology has the potential to allow LED manufacturers to create higher performing devices by reducing the multiquantum well or active regions exposure to high temperatures which leads to a performance loss. The next goal is to demonstrate improved LED light output (lumens per watt) by creating devices using the BluGlass low temperature p GaN layer. Carnegie Wave Energy has won a $1.27 million AusIndustry grant to support a CETO Seawater Desalination Demonstration Pilot Plant. The funding is for the design and construction of a $2.5million Desalination Plant to produce fresh water, and which will be powered by hydraulic energy from an offshore CETO system. The aim is to demonstrate that Carnegies wave energy driven technology has the potential to reduce the amounts of electricity consumed and greenhouse gas emissions produced compared to current seawater desalination processes. Carnegie's chief operating officer, Greg Allen said the ability of CETO to produce both clean power and water is a significant advantage of the technology, and the project is planned to be integrated into the Perth Wave Energy Project. The Perth Wave Energy Project is due to begin construction shortly with power production to commence in early 2014. The construction of the desalination pilot will follow power production. Carnegies licence agreement with the Australian Department of Defence allows for the production and supply of fresh water to the HMAS Stirling navy base on Garden Island. Dyesol has attracted a $4 million investment from Saudi Arabian industrial giant, The National Industrialization Company of Saudi Arabia, also known as Tasnee. The investment is a 15 month redeemable loan note convertible into shares at 16.6 cents per share and with a zero coupon as required by Saudi Arabian law. During an initial six month exclusivity period, Dyesol and Tasnee will discuss a further investment up to a total of $20 million, partnership and investment possibilities around R&D collaboration, large scale production share, and potential demonstration projects in the Middle East. Dyesol is to hold a share purchase plan at 16.6 cents per share to raise another $2 million and enable shareholders to invest alongside Tasnee. Tasnee is a $5 billion diversified industrials company on the Saudi Arabian Stock Exchange and the world's second largest producer of titanium dioxide. It owns several titanium mines in Australia, mainly through its acquisition of Bemax Resources. Its subsidiary, Cristal, has been working with Dyesol UK since 2009 to develop nano titania for use in Dyesol's steel project with Tata Steel Europe. Nano titania is a semi conductor and a key material in the manufacture of DSC photovoltaic solar cells. Tasnee will have the right to invest up to $20 million during the exclusivity period at 18 cents per share. Shareholder approval will be needed if the holding goes beyond 20 per cent. Eco Investor is ceasing coverage of Earth Heat Resources as the company is withdrawing from its Copahue geothermal energy strategy in Argentina and looking to develop an oil and gas business. Chairman Dr Raymond Shaw told the companys annual general meeting that a corporate review identified a need for a sweeping change in portfolio assets and that these will be in the conventional and unconventional oil and gas sector. The companys geothermal energy strategy is too hard to implement due to funding issues. Mr Shaw said that 2012 had been a very tough year and Argentinas political situation weighed heavily on finding project funding. The near complete lack of interest in the sector in Australia and overseas coupled with significant challenges in general capital markets contributed to a lack of ability to fund the project, he said. Without an equity funding portion, the debt instruments announced by the company cannot close. Yet no change to those underlying issues can be sensibly viewed as occurring over the next 12 months, he said. Earth Heat is in discussions with its joint venture partner to divest or withdraw from the project. Enerji made a loss of $7.3 million for the full year to 31 December 2012, with the result including a write down on the carrying value of the Carnarvon project of $1,922,000. During the year Enerji raised a total of $3,804,561 through the issue of securities. Even if all goes to plan after the merger of K2 Energy and Mears Technology Inc, first revenue is not expected until 2014-15. In a presentation to shareholders, K2 said it is targeting its first commercial licensing agreement in 2013, with royalty based payments to commence in 2014-15. The company is focused on the commercialization phase of its MST CMOS technology, with 95 per cent in the chip industry. Liquefied Natural Gas has been added to the All Ordinaries Index in the March rebalance by S&P Dow Jones. In other news, the Office of Fossil Energy in the US Department of Energy (DOE) has authorized LNG subsidiary Magnolia LNG, LLC to export up to 4 million tonnes per annum of LNG from its proposed LNG project site at the Port of Lake Charles in Louisiana. The authorization is valid for LNG sales to commence within 10 years and is for a period of 25 years from the first LNG sales. Metgasco has been removed from the All Ordinaries Index as of the March rebalance by S&P Dow Jones. Papyrus Australia has engaged MAP Capital Advisors to advise on its strategy and funding options. MAP Capital will provide an independent strategic view of Papyrus and its opportunities to better exploit its intellectual property for converting waste banana tree trunks to timber products. It will assist with discussions and negotiations with existing joint venture partners and those introduced by MAP Capital in Australia and overseas. It will also advise on short and medium term capital raising approaches to improve shareholder value. So Papyrus will not release the machinery until the joint venture partner, EBFC, pays for it. Negotiations have been very protracted but continue, said Papyrus.